KTM's Rear Tail Bag made by Bags Connection is a great bag for everyday use. What's even more unique about it is the way it attaches. It's horseshoe plate allows the owner to quickly remove the bag when needed. 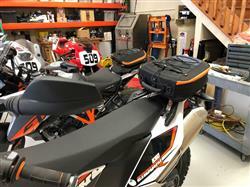 This is the necessary rack for the KTM 690 Enduro R and SMC. Bracket fit perfectly, has quick release to get to gas tank filler. Great mount but does limit the use of your rear grab handles weather or not the bag is installed. Not too bad though, just have to retrain your hand a bit... Then all is well. But strong as hell.